The inaugural Common Sound Festival is coming to Marquette Park on Saturday, September 30th. The festival is being produced by Dutchtown South Community Corporation and will feature music, dance, food, craft vendors, and a chance to preview the Marquette Field House. Festival goers will also help to break the record for world’s longest soul train! Your help is needed! 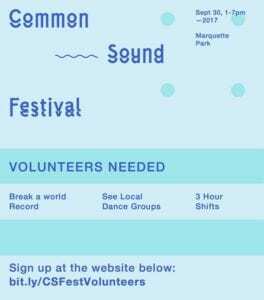 To see the available volunteer shifts and to sign up go to bit.ly/CSFestVolunteers. You can also contact Brock with DSCC for more information at brock@dutchtownsouth.org or (314) 352-4865. Be a volunteer and help break a world record! This post was updated on August 31, 2017 . Read more news about Dutchtown, Dutchtown Events, Dutchtown South Community Corporation, Festivals, and Volunteer Opportunities.